Brian Cirmo : "Patterns, Cycles, and Change"
Sue Murphy : "Figures & Faces"
Judith Hand : "Spring is on the Way"
The Wilson Art Gallery will host "Here & There," an exhibit of paintings and pastels of landscape and figurative works by Mark Topp. With little formal art education, Topp studied portraiture while in high school with internationally renowned Syracuse painter, Robert Hofmann, subsequently broadening his portfolio to include landscapes. 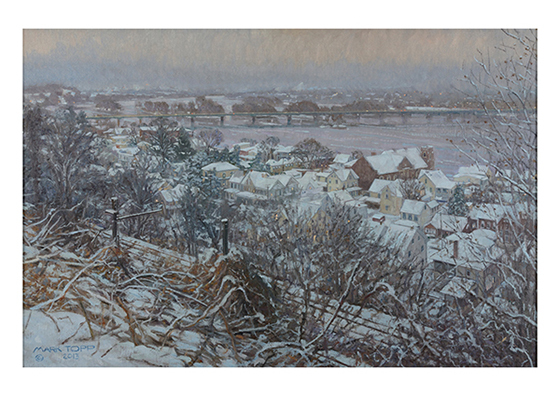 His cityscapes and portraiture interpreting central New York and Pennsylvania have been exhibited in Syracuse, Harrisburg and Pittsburgh. He has also received awards from the Cooperstown Art Association National show (2000) and the Mystic Maritime International (1989). On Friday, October 9, from 4 to 6 p.m., there will be an opening reception for the exhibit, which will be on display at the Wilson Art Gallery from October 9 to November 6 during regular library hours. The reception and exhibit are free and open to the public.